Tonkatsu DJ Agetarou is my clear choice for underrated anime of this Spring 2016 season, it's a shame that few people gave it a try because it's a really enjoyable anime. Agetarou works at his family's tonkatsu (a Japanese food which consists of a breaded, deep-fried pork cutlet) restaurant, he doesn't like it much, but destiny made him discover the disc jockey world, and, for his surprise, he realizes more and more every episode how similar is cooking and working in a tonkatsu restaurant to being a DJ in the details about them. Something that I really like about this anime is the "bro" feeling it has, everyone is just so cool to the others and there is little to no drama, when Agetarou fails, he won't go in a neverending despair, nor blame anyone for his mistakes, he accepts it and looks for a way to improve, and, with the help of the great and likeable cast of side characters, he always comes back and shows what he learned, this makes for a really entertaining and positive experience every episode in his way to become the best disc jockey. The art may look ugly, and it arguably is, but it just fits the series so well that can't be complained about, the sound part is amazing, I find myself moving to the rhythm of the music every episode thanks to the catchy themes this anime has. Tonkatsu DJ Agetarou is an anime that totally deserves a watch and if you're looking for a feel good experience with lots of fun and cool characters, this anime is just for you. Imagine having to succeed the family food business without the motivation to cook anything. What would you do in this situation? For the mischievous Agetarou Katsumata, the answer is clear: become a professional DJ, and show the world how mixing electronic music can make you a better chef! Anime has essentially covered every music genre—rock, pop, and even hip-hop—but electronic music is a first for the medium. As its likely pioneer for anime, Tonkatsu DJ Agetarou does well in presenting the life of a rising DJ star through an expert lens. While Agetarou fights his way to the top, we see the ambition, creativity, and technical knowledge needed to succeed in the professional world of DJ’ing. Becoming a DJ comes with the spectacular club life, dancing girls, and addictive fame, but none of that will last if Agetarou refuses to work and learn. It’s not easy reaching stardom when nervous breakdowns and vicious adversaries hinder your goal, but even with all the obstacles getting in Agetarou’s way, the bright young lad seldom fails to think of a Plan B. His street smarts and social skills make him one of the most entertaining leads in recent memory. For its main appeal, Tonkatsu DJ Agetarou splits its focus between our protagonist’s night life and his daily errands as the successor of his family’s tonkatsu shop. With his obnoxious father egging him 24/7 to learn the art of tonkatsu preparation, Agetarou must find a way to ease the burden of his responsibilities. And so he does—by becoming a professional DJ! 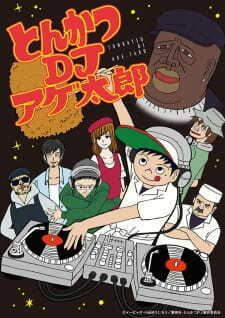 Although its synopsis illustrates the show as the biography of a rising electronic music artist, the gist of the story is an analysis on the similarities between disk jockeying and preparing tonkatsu. The sound of meat searing in the fryer; the tapping of the spatula; and the rhythm of the knives: these kitchen procedures are skills that are comparable to the art of disc-scratching and record-mixing. Whereas Agetarou rejects the idea of becoming a chef at first, his realization that his talents in the kitchen and dance floor intertwined with each other leads him into a journey to master both disciplines. With an equal perspective on both sides of Agetarou’s dynamic life, Tonkatsu DJ Agetarou feels like a refreshing mix of comedy, music, and a little bit of shounen. Agetarou and his dual life is certainly fascinating, but Tonkatsu DJ Agetarou wouldn’t have half of its charm without its great side characters. Agetarou’s eccentric family are the first supporting cast members to hit the screen—and boy are they a riot! We have our hero’s dad who can’t give him a break and his little sister who fears for his future love life. During times of trouble, Agetarou consults his neighborhood friends—a gang of unruly youngsters—for some farfetched advice. By far the most memorable side character though is the peculiar Iori Oiri, known better by his stage name “DJ Oily.” Other than Agetarou himself, DJ Oily is the most important character of the show. Not only is he responsible for the boy’s character development, but he is also the wittiest mentor figure you’ll ever meet. It’s hard not to chuckle when the experienced DJ teaches Agetarou his tricks of the trade that are useless, irrelevant, or even downright illegal. The incredibly catchy soundtrack is another main draw of Tonkatsu DJ Agetarou. From the smooth beats of “Cold Chillin’” to the calming rhythms of “Rainy Lenny,” the music collection is nothing short of impressive. I often find myself bobbing my head whenever Agetarou mixes one of his tracks. The type of electronic music in this show is unlike that by contemporary DJ’s such as Tiesto or Avicii; rather, the tracks resemble the old-school grooves of Fatboy Slim and Daft Punk. Whether you’re an electronic music buff or a casual listener, you’ll likely surf for the name of these tracks online after each episode. Be sure to watch with headphones for the full experience! Sadly, Tonkatsu DJ Agetarou will likely remain under the radar because of its controversial artstyle. Instead of cute girls and handsome men, we get a cast that looks like the Japanese version of Beavis and Butthead. The color palette for the show is very murky, and the wonky animation clearly identifies it as a budget project. For the majority, such a noticeable departure from this generation’s artstyle is enough to draw their attention elsewhere. However, a few episodes in will reveal that all of this is done purposely. For a show bearing the premise of a western adult cartoon, it makes sense that the visuals must go with the flow. Some will accuse the studio of being cheap—a claim that is simply untrue. As you go deeper into Agetarou’s story, you’ll realize that the visuals fit the show like a perfect pair of jeans. Although Tonkatsu DJ Agetarou starts off on a high note, the show’s entertainment value steadily wears down during the second half. Instead of the usual episodes revolving around Agetarou and the challenges he faces as a rising DJ, the story turns into a slice-of-life comedy that feels like filler. For a show comprising twelve episodes with a runtime of only ten minutes each, it’s quite surprising that a drastic change in direction exists. This is not a problem for those who watch Tonkatsu DJ Agetarou mainly for the comedy, but it feels like such a waste since the growth of Agetarou is a prominent aspect of the show. Because of the show’s identity crisis, the ending suffers from a feeling of incompletion. Tonkatsu DJ Agetarou is a refreshing attempt to introduce anime fans to the world of electronic music. The show not only contains a good balance of humor and charm to support its captivating character-driven story, but it also presents a strong moral that stresses the importance of personal dreams and family responsibilities. Though the show suffers from a weak second half and finale, its witty cast and catchy soundtrack carries the story well enough until the end. You see all sorts of musicians in anime - jazz, rock, death metal, classical, pop... But until now there has not been, to my knowledge, an anime series devoted to electronic music. Tonkatsu DJ Agetarou has righted that wrong at last and put electronic music in the spotlight where it deserves to be. As a fan of electronic music, I really cannot begin to express how much I enjoyed the series. It takes electronic music seriously, it shows both the artistic and the scientific side of it. Being a DJ requires vast knowledge about different types of music, the ability to imagine how various tracks can be put together and the technical skills to operate the equipment. But this anime also shows one of the main aspects of electronic music - its creativity. Anything can become rhythm and melody, from the pitter-patter of raindrops to the sizzle of oil in the fryer. Music is everywhere, but it takes a talented person to discover it, and Agetarou is just that person. His wonder at discovering the DJing world is infectious, you cannot help but root for him, because he goes through things most people understand - chasing his dream, learning things about the world, trying to connect with people... The anime has a rather accurate depiction of the path of a young DJ, including the difficulties he faces and the obstacles he has to overcome, including stage fright, inexperience and envious rivals. The art differs very much from the moe aesthetics and does not have and 3D, so it might take some time to get used to it for some people, but I personally found that the rather simplistic art style often reminds of graffiti, contributing to that feel of night clubs and underground parties. The music is on point, some of those songs will stay in your head for a long time. The series has quite a bit of humour too, just take a look at those character names - Big Master Fry, DJ Oily, there is definitely a theme there. And I really like how despite tackling serious themes with accuracy, the anime stays light-hearted and has a general feel-good atmosphere. Agetarou has good friends and a nice family and is surrounded by helpful people, and is himself an overall nice guy, and at times it really brought tears to my eyes when his music once again showed the best in people and united everyone. All in all, this anime is a must-see for any fan of electronic music. And if you are not a fan, you should still give it a try, maybe it will change your perspective on this type of music! Good chill. Sometimes people fail to remember that anime is simply the Japanese word for any and all animation. But outside of Japan, the word typically refers to any and all Japanese animation. Of course, there is a typical "anime art style" that comes to mind when thinking about contemporary Japanese animation. This style (realistic body proportions, colorful hair, thin outlines, large eyes, etc.) comes to mind because, arguably, it is used in almost all modern anime. This has sometimes led to some Western, non-Japanese works (Teen Titans, Avatar: The Last Airbender) to be described as "looking like anime." But, how can anything "look like anime" if anime is, by definition, any animation? Now, let's not turn this review into a discussion on the semantics of the word "anime." Let's simply go with the latter definition: any and all Japanese animation. Still, anime is not limited to a specific art style. That is important to remember, because when shows like Ping Pong: The Animation or Tonkatsu DJ Agetarou pop up every now and again, some people tend to be a bit taken aback by the atypical art and animation style. People have become so used to the usual style of anime art and animation that they may immediately dismiss a show like this. But to me, this show is breath of fresh air. "Refreshing" is the word that best describes this show to me. I actually look forward to shows with unorthodox animation and art styles such as these. They are a treat to watch, not because I am necessarily tired of the "typical" anime art style, but the uniqueness of these shows keep things fresh. In a sea of anime shows that have not only the same art style, but often the same interchangeable characters, tropes, and settings, anime like these tend to stand out a lot for me. But not only is it Tonkatsu DJ's minimal and cartoony art style (which I personally love) that makes it stand out. The anime has an incredibly fast pace, probably due to the fact that is a short based on a gag manga. This keeps things quite upbeat and essentially makes it impossible to get bored. The subject matter is also fresh. This is the first DJ anime I've seen, and I certainly hope it won't be the last. Most music anime nowadays tend to be about generic idol groups, so something as niche as DJing is incredibly welcomed. The references to club and DJ culture are also greatly appreciated. If you are one of those anime fans that leave the house, you may also notice that some of the characters actually have relevant designs and fashions. Some of the OST is great, and you can tell there was genuine effort put into it. I could imagine turntablists legitimately scratching to some of the beats on there. Cold Chillin' is some quality stuff, and Rainy Lenny actually sounds like a rare groove! However, I would like to say, Tonkatsu DJ does not have the most impressive animation. Though the fast pace sort of compensates for it, there is a lot of repetition and not much fluid movement. You can tell this thing was done on a budget. But I have to applaud the people involved for the final product despite any monetary limitations. Shows like these are what keep me interested in Japanese animation.